Ranger motorcycle lifts are full featured lifts that are packed with all of the most popular features. The RML-1500XL is Ranger's hottest product! This lift has become one of our most popular items. And why not? It comes with just about every feature most people want. Plus, because it's made by Ranger, you know it's good quality.It's a huge hit with ATV and motorcycle enthusiasts across the country. 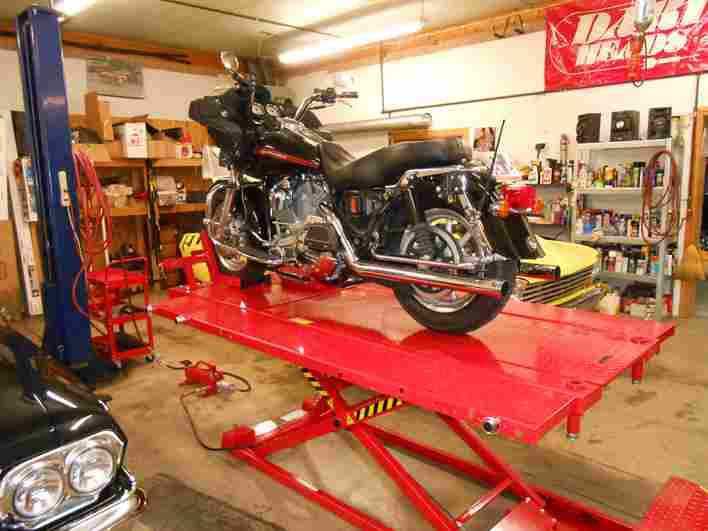 This is the ultimate motorcycle lift. Is has a super-wide stance for stability, extra long table to fit the longest stretch choppers, and is built super tough. It features superior welds, heavy duty 12 gauge steel frame engineering, quality welds, and the best powder coating process in the industry. Others may copy Ranger, but beware of copy-cats. This is the original. Just because they look similar, doesn't mean they're built the same. It features built-in retractable swivel casters, reversible bolt-on side decks, an extended motorcycle approach ramp for low profile bikes, as well as a wider, steeper ATV approach ramp, automatic safety locks, support poles to free-wheel the rear wheel, removable tool and parts tray, and a single hydraulic lifting cylinder and retracting rear wheel deck, a secondary drop-in deck features rollers that makes easy work out of wheel rotations and turns your motorcycle lift platform into a motoring test simulator. Pump can be operated manually by hydraulics, or you can hook air up to it for speedy lifting. 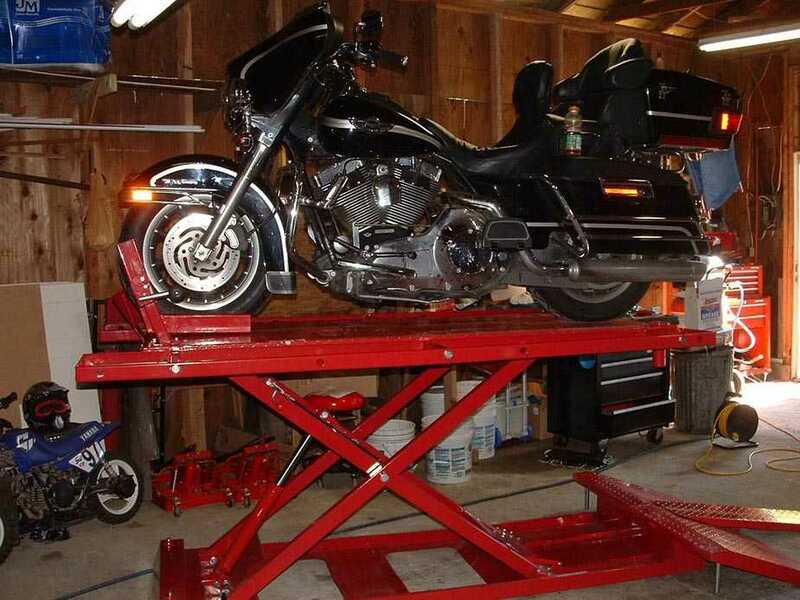 Bottom line, this motorcycle lift has a heavier capacity than most, lifts higher than most and is more versatile than most. Remember - Just becasue that other lift looks similar, doesn't mean it is. Ranger has a reputation of not only premium products, but unequalled technical support. They're obsessed with making sure that you are a BendPak / Ranger customer for life, so we provide you with the absolute finest support after the sale in the world. It's both our pleasure and our obligation to you.  The moment you purchase a product from BendPak / Ranger and ASEdeals, you became part of a family of folks who are passionate for automobiles and garage equipment, just like you are. We're just happy to take care of you and are totally committed to making it as easy as possible to solve any equipment issues you may have. With BendPak's award‐winning Certified Service™ program, no other manufacturer even comes close. Multiple locking positions allows for various working heights.Slide-in panel shown above allows for access to free spinning rear wheel. 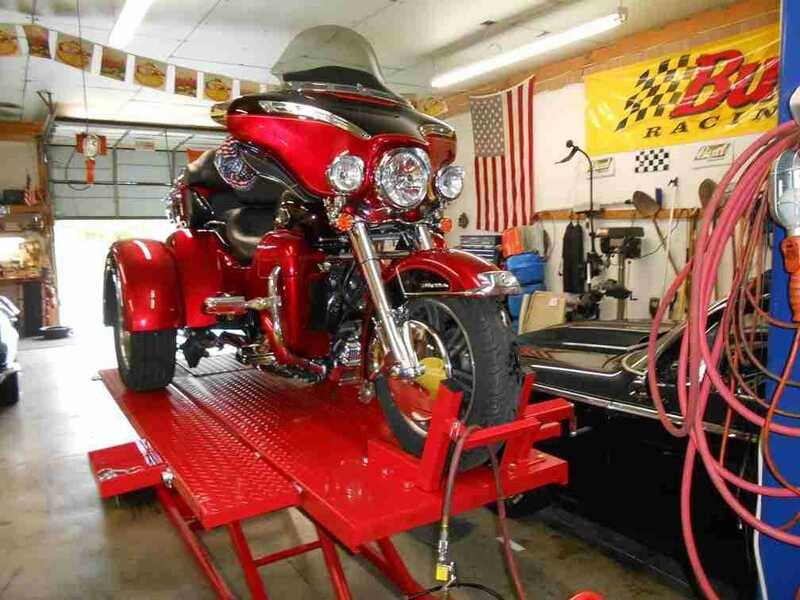 When used with straps and support poles shown, you can perform rear wheel work.A secondary drop-in deck features rollers that makes easy work out of wheel rotations and turns your motorcycle lift platform into a motoring test simulator.Two ramps are provided. A wide, steep ATV ramp, and a longer motorcycle ramp for easier loading. Approach ramps are easily removable.Use support poles in rear in conjunction with straps to suspend rear of bike for free wheel work.Nowhere else will you get a lift packed with so many features at such a great price.Retractable casters makes it easily portable - even while it's loaded! A combination of power, solid construction, and user-friendly features makes the Ranger RML-1500XL the best motorcycle lift money can buy. Features 12-gauge welded-steel construction, a non-skid diamond-plate platform surface and full travel automatic safety locks allowing various working heights. Side decks can be easily removed to provide a more compact work area for closer access to bikes when performing maintenance work or cleaning detail. A humongous 1,500 lb. lifting capacity handles just about anything that rolls. Safe and reliable means it’s been life-cycle tested beyond industry standards. Retractable, built-in, full-swivel casters provide stow-and-go capability even when loaded. Precision ball bearings improve rollability and are maintenance free. A gentle slope, textured diamond-plate approach ramps, and a secondary cheater ramp means even ground huggers can be loaded effortlessly. The RML-1500XL gets its power from a potent commercial-grade hydraulic power system that produces big lifting muscle right off the ground. A dual-function power unit provides either air or hydraulic pump operation. User-friendly controls increases productivity, reduces injuries, saves money, and improves job satisfaction. A wide base frame combined with full perimeter tie-down rings provides a stable work environment ensuring bikes and choppers remain upright; tip-over concerns remain a thing of the past. Chrome alloy hydraulic cylinder provides smooth controlled operation to keep things nice and civilized and an extended-stroke ram means the RML-1500XL stands tall for improved ergonomics. A rigid tubular-steel wheel vise provides better stability and features a hardened steel crank and ergonomic handle for fast and easy set-up. Durable non-slip rubber contact plates help protect expensive wheels. A removable rear deck provides drop-down clearance and accessibility for wheel and suspension work. 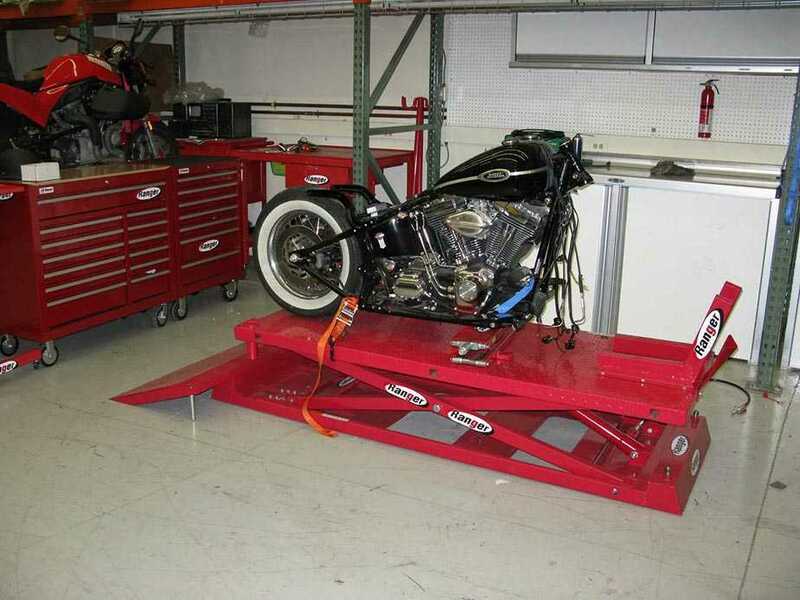 A secondary rear deck with built-in dyno-rollers makes easy work out of wheel rotations and turns your motorcycle lift platform into a motoring test simulator. Rear vertical support poles provide a secure and stable support for hoist straps or tie-downs for elevated bike testing or other floating required services. A removable tool and parts tray can be positioned at multiple Quick-Lock positions located on the perimeter of the lift platform. "The Ranger motorcycle lift has been in full use since the day it was dropped off. We have been playing with it to see just how we like using it with all the options installed and I have enclosed a pic of it in usage with the sides off of it. The Lift is definitely one of the nicest I have used and I really like the locking mechanism. Now that the lift is in Tech Center here in the offices, we have been able to increase our tech shoots ten fold. Now the only problem is we have to fight over who gets to use the lift." The motorcycle lift is here and already has had several bikes on it within the first hour. I have included two pics with my '03 Ultra on the lift. Thanks for a great product and I look forward to doing more business with you in the future". "Guys, Here's a few pics of my bikes on the 1500 lift. The trike naturally is heaver than the road glide. The lift has no problem lifting the bikes great product. One Hellva lift."